We recently attended a wild game feast with my husband’s friends. There were hundreds of people at the event. All variety of animals were served by different hunters including the common venison and wild turkey. And then there was the unusual… bear, alligator, and alpaca. It was an awesome event because all the hunters expertly prepared the meat. I was quite adventurous and tried a lot of things. I will admit that the only reason I ate those things was because they eat all sorts of strange meats on Game of Thrones. I feel sorry for Lord Bran who has to eat all those rabbits, because it’s gross. And I will also admit that I did not care for most of the wild game. The most delicious food I had at the festival was seafood, oysters, oyster deviled egg, fish of all varieties. My most favorite of all was the fresh yellowfin tuna. The fish was caught off the Carolina Coast that morning and sliced up for dinner. It was the best raw fish I have ever tasted. The weather is perfect in Eastern NC, hot sun with a cool breeze. I often buy fresh fish with plans for blackening and grilling, and then it rains in the evening. This is a great indoor method for preparing fish, from the store or fresh caught. This recipe is great for thin filets of fish. It’s not really appropriate for yellowfin tuna or any thicker fish cuts. Using panko bread crumbs instead of deep frying makes this fish much healthier and does not sacrifice any of the crunch. Serve this with seasonal vegetables and rice. I use blackening spices to season the fish, this can be titrated to your level of spice, see here. You can use just salt and pepper or whatever spices you like with fish, lemon pepper is one of my favorites. The breading process here is very useful to master. This is the same process I use for chicken parmesan and chicken tenders (recipe coming soon). Serve this tilapia on a warm day with sauvignon blanc. 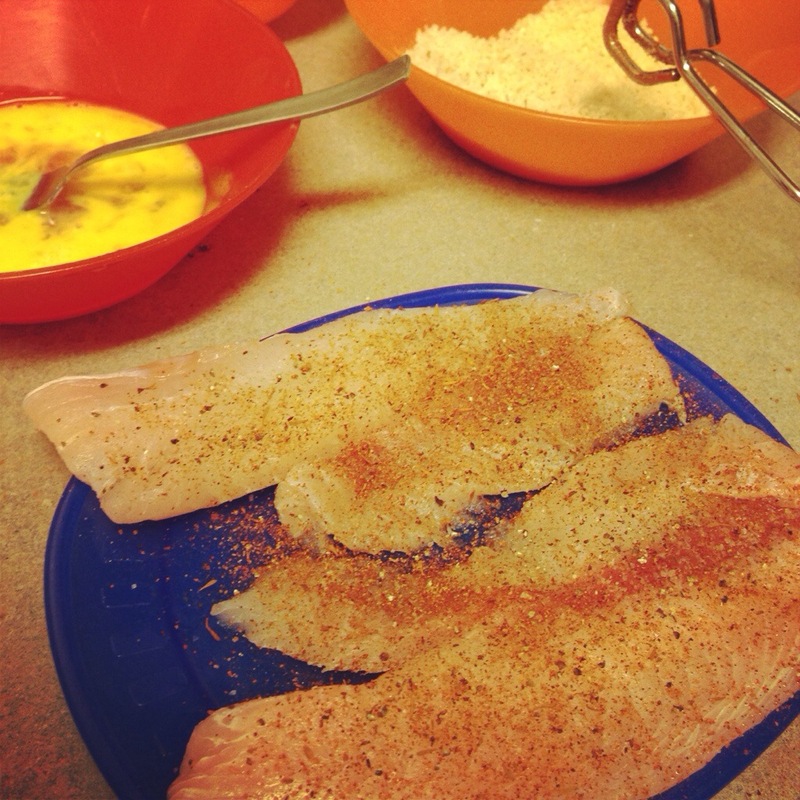 Season the tilapia generously with salt, pepper, and blackening seasoning. Set up the breading stations with three shallow bowls. One bowl should contain the flour, the next egg, and the last bowl panko bread crumbs. Dredge the fish, one filet at a time, in the flour, coating both sides and shaking off any excess. Then place the fish into the egg, coating evenly. 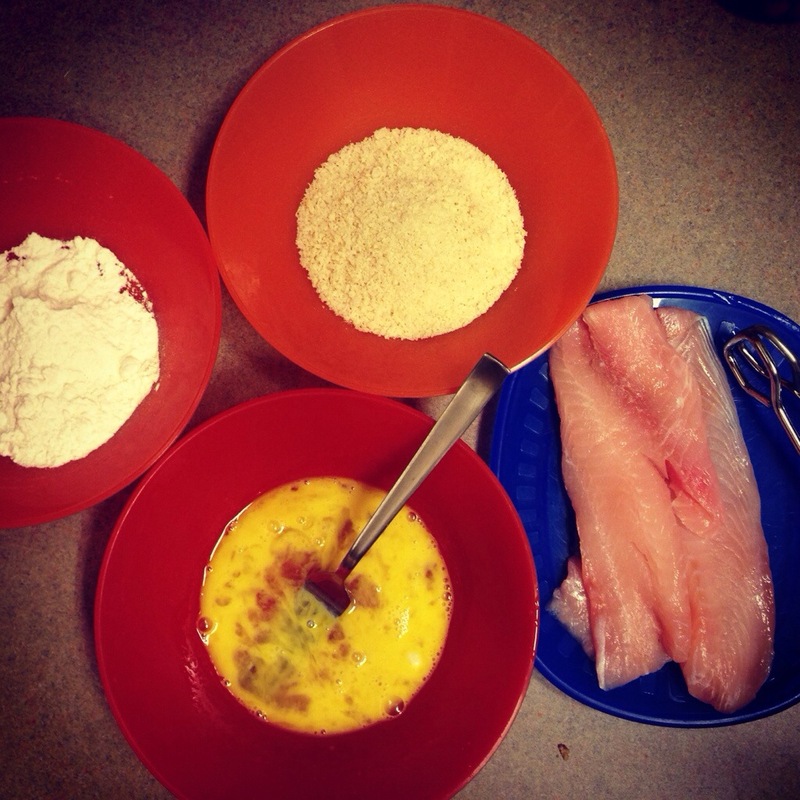 Now dredge the fish into the panko bread crumbs, pushing into the bread crumbs to coat the fish. Set aside to a plate and repeat for all of the filets. Heat butter or canola oil in a large skillet over medium high heat. When the skillet is hot, place all of the fish in the pan. Cook for 3-4 minutes on each side, depending on how thick the fish is. 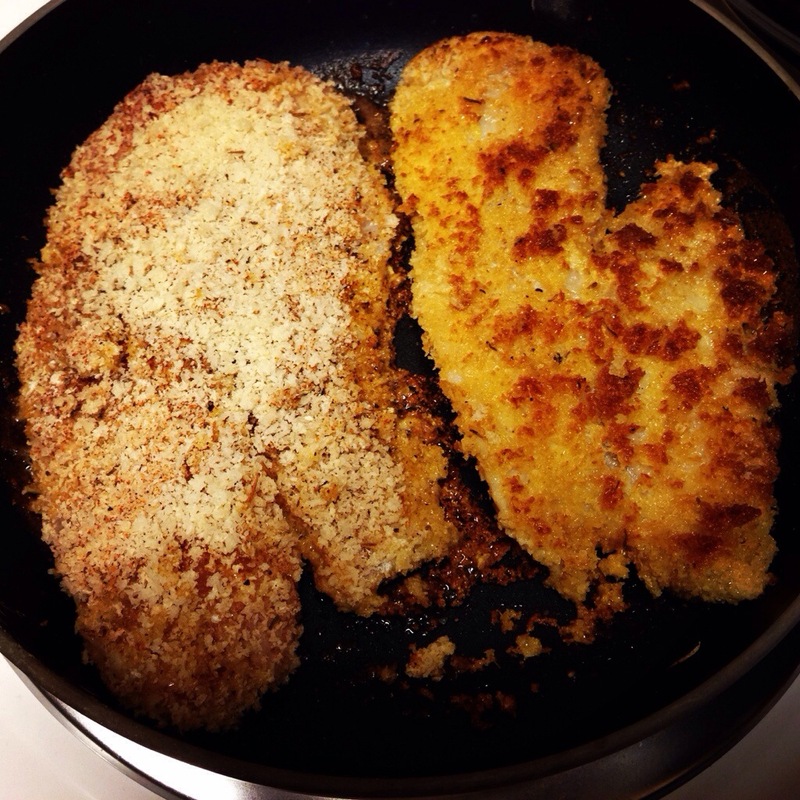 The breading should be golden brown and the fish should flake apart easily with a fork. This has to be my absolute favorite freezer meal. 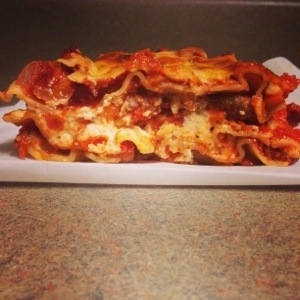 The lasagna tastes just as good from the microwave weeks later after it is made. Not to mention it has just 508 calories per serving! This is a nearly impossible feat for any lasagna style dish. There is no sacrifice in flavor here either. I am typing this post while my bolognese simmers on the stove and it smells insanely good. It really is easy to make this delicious sauce. 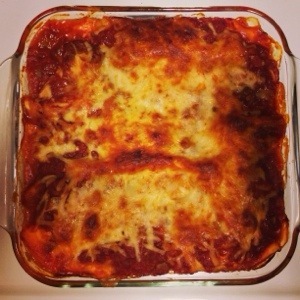 I am sure one day I will tackle making my own pasta noodles, but for now I use the oven ready lasagna. It works out beautifully if you do one simple trick. 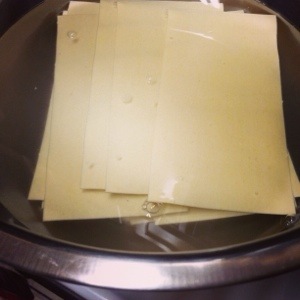 Soak the noodles in water for just 30 minutes prior to assembling the lasagna. Do not leave them soaking too long or they will get too soggy. If you are going to freeze this dish, you can freeze the entire pain. I recommend cooking the lasagna and packaging individual portions in plastic freezer bags or tupperware. Use spicy or regular italian turkey sausage in this depending on your preferences. I have had trouble finding the spicy sausage so I use regular and add crushed red pepper flakes. If the day of your dinner party is going to be busy, definitely make your bolognese and cheese mixture ahead of time and store them in the fridge. In these photographs from today I use two separate lasagna pans (so that one pan could be delivered to a friend). The directions below however are made for one large pan. You could use one 13×9 pan or two separate pans depending on what kind of pans you have. I almost always use dry white wine in the recipe. I have used red wine before when it was all I had. I don’t think there was much difference in flavor. I think dry white wine complements this dish well when serving. But something about bolognese begs for red wine. 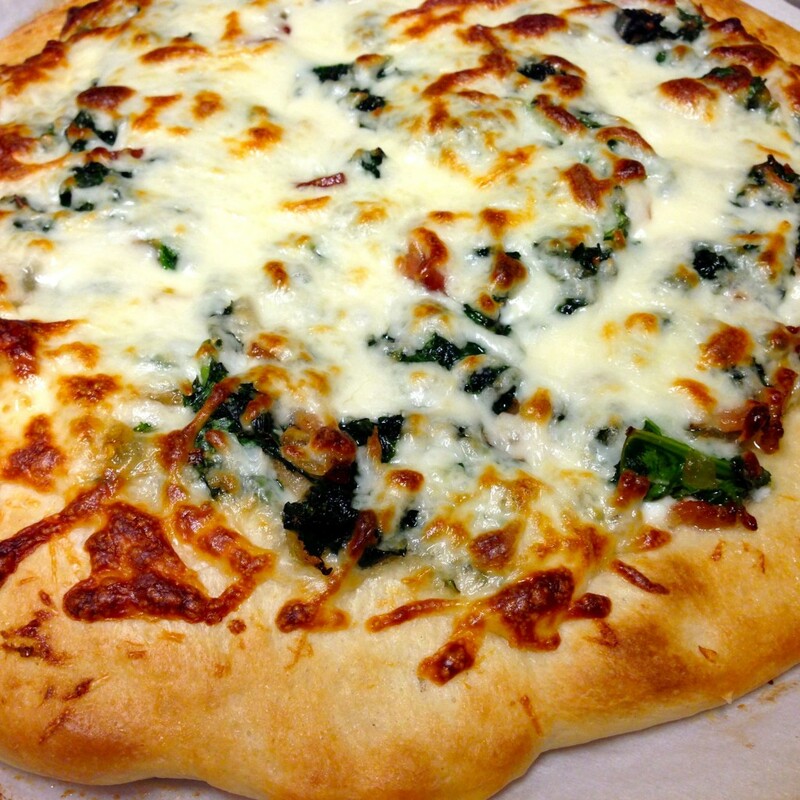 Serve this with McManis Pinot Noir, a reasonably priced pinot that does not disappoint. In a large nonstick skillet, heat the olive oil over medium-high. Add in the onions and carrots. Sauté for 5 minutes. 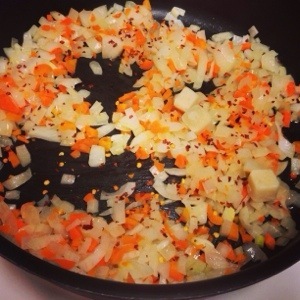 Add in the garlic and red pepper flakes, cook one minute. Mix in the turkey sausage. Sauté over medium heat until the sausage is cooked through, about 12 minutes. Add in the wine and boil for 1 minute. Mix in the crushed tomatoes, basil, and oregano. Bring to a boil. Decrease the heat to maintain a light simmer. Simmer for 10 minutes until the sauce thickens slightly. 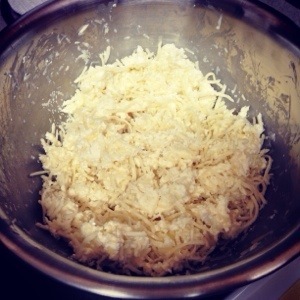 In a large bowl, mix together the ricotta, 3 cups mozzarella, 1 cup grated parmesan cheese. Season with a few turns of the pepper grinder. 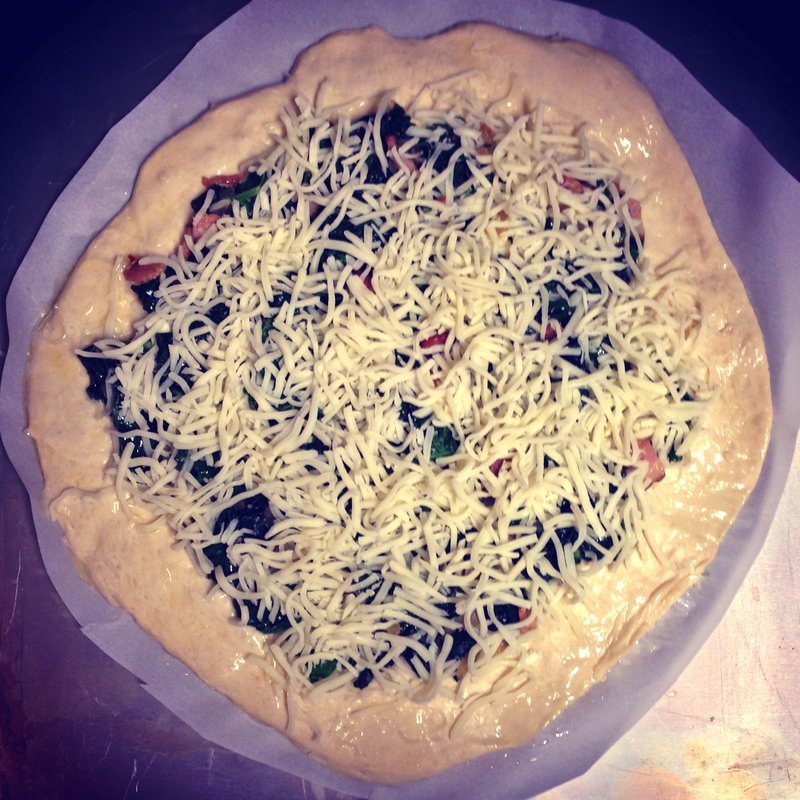 Cover and keep in the fridge until ready for assembly. In a large bowl filled with hot water, soak the noodles for 30 minutes. Make sure to separate them a few times so they do not stick together. Preheat the oven to 375 degrees. Spread 1 cup of sauce over the bottom of your 13×9 inch pan. Arrange 4 noodles crosswise. Use your hands to spread 1/3 of the cheese mixture over the noodles. Cover with 1 cup of sauce and then 4 more noodles. (I mash the cheese and sauce flat with the noodles as I go.) Repeat two more times. Spread any remaining sauce over the top. Sprinkle with 1/2 cup parmesan and 1 cup mozzarella. 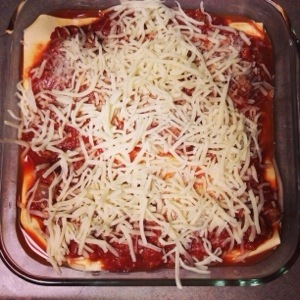 Bake the lasagna uncovered for 50 minutes, rotating the pan halfway through. Let stand for 15 minutes prior to serving. Not only is it the stew and soup time of year, it is also the best time to make casseroles. These enchiladas will not disappoint you. They are especially delicious considering their 450 calorie per serving price tag. The yogurt and reduced fat cheese make a big difference here. The second best thing about these enchiladas is that in one step you combine 11 ingredients. No matter what your level of cooking experience, you should not skip over this recipe. A lot of the Bubbly Kitchen casserole style recipes call for cooked chicken breast. Whenever I light the grill to make dinner, I prepare 4 extra chicken breasts. If you are making a casserole and don’t have cooked chicken on hand, just saute the chicken breasts in a pan with italian dressing. For this recipe, I sauteed them in salsa and olive oil. Cook until the internal temperature is 165 degrees. Serve these enchiladas with a bottle of Gnarly Head Chardonnay. This is a rich and buttery value wine. Preheat oven to 350°. Prepare a 13 x 9 inch baking dish by coating with cooking spray or butter. Combine the first 11 ingredients, the chicken through the green chiles, in a large bowl. Remove 1 cup of this mixture; set this aside. Heat a large skillet over medium-high heat. With 1 tortilla at a time, brush oil over both sides of the tortilla. Place the tortilla in the pan and cook 5 seconds on each side or until toasted slightly. 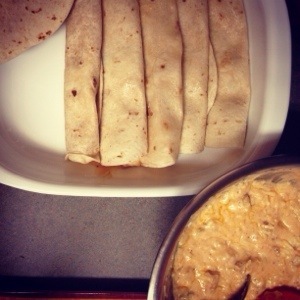 Remove the tortilla from the pan; spread 1/2 cup chicken mixture down the center of the tortilla. Roll the tortilla up and place seam side down in your prepared baking dish. Repeat these steps with the remaining 7 tortillas. 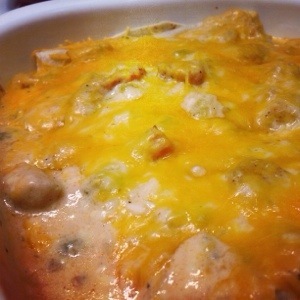 Spread reserved 1 cup chicken mixture evenly over the enchiladas. Cover (with lid or foil) and bake at 350° for 20 minutes. Uncover, sprinkle with cheddar cheese and bake for 5 more minutes.